Interns play a big role at CRP. Among many things, they help us run our social media pages, apply for grants, maintain our website, and coordinate programs. This summer, we’ve welcomed multiple new interns, and they’ve already done some great work! Meet our new interns! From left to right, Asha, Calvin, Ali, Genae, Ben, Matthew, Anjali, and Suleiman. Matthew Magann, Genae Matthews, Ben Chance, and Suleiman all intern in CRP’s Communications Department. They create content for Facebook and CRP’s blog, bringing stories of our community to you, our supporters. 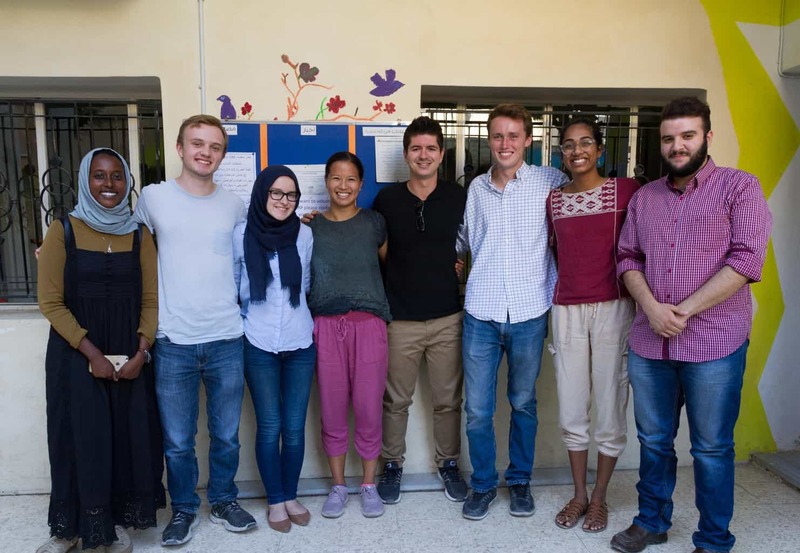 Matthew, a sophomore at Dartmouth, and Genae, a senior at Wellesley, both decided to spend their summer abroad helping refugees and exploring a new country. “I’d visited Jordan before and decided I wanted to come back for the summer,” says Matthew, “and I knew CRP did some crucial work.” Ben, our videography intern, graduated from the University of Southern California a few years ago. After working in the film industry in LA, he decided to take time away to pursue humanitarian work. Rounding out our Communications team is Suleiman, an Iraqi refugee, who first came to CRP as a beneficiary, then as a volunteer. Though out of school for three years, last fall he re-entered high school at King’s Academy as a sophomore. This summer he joins us as an intern working in interpretation and project management. Teresa Perosa, a graduate student at Columbia, joins us as an Advocacy Project Peace Fellow. Originally from Brazil, she’s worked as a journalist in multiple countries. This summer she focuses on Hope Workshop, helping empower women in the refugee community. The Grants Department has welcomed Bryn Prater, Ali Saueressig, and Calvin Wilder as summer interns. These interns write and apply for grants, securing critical funding for CRP. Currently, about 30% of CRP’s budget comes from grants. As we expand, we hope to make that 50%, so our grants team plays a major role in helping us to grow sustainably. Bryn, who recently graduated from Colorado College, plans to become a social worker. She considers her internship “an opportunity to see how an NGO functions.” Similarly, Ali came to CRP in order “to gain grant-writing experience in the humanitarian field, especially for a grassroots, community-based organization like CRP.” Calvin wants to pursue humanitarian work in the future; he sees his internship as “an in-depth look at NGO work here in Jordan before I hopefully return to the country post-graduation.” We hope that all of our interns learn about the refugee crisis and what it’s like to operate a grassroots organization as they sharpen their skills this summer. Interns play a critical role at CRP, and we couldn’t do what we do without them. We can’t wait for the rest of the summer. Interested in interning or volunteering with CRP? See this page for more information.